Do You Ignore This Basic Acting Skill In Your Auditions? Many do! No matter what training you’ve had as an actor, from just a class here or there to a full MFA degree, and beyond, you’ve undoubtedly been instructed to listen to the other characters in a scene with you. The art of listening is an exalted concept for actors, and when done well it demonstrably makes you so much more interesting to watch. So I’m not going to waste your time here with why this is so; you undoubtedly already know all that. So what do actors do when they’re in this kind of situation? They use the moments when the reader is speaking to refresh themselves on their next line by looking at the script, either in their hand or in their head. The problem is, that’s often what it looks like you’re doing. Many actors think they must be, or appear to be, off book in an audition. But that is way overstated. It’s far more important that you bring the character to life. You do not get enough credit for not looking at the sides to make up for what you lose by not being an actively engaged listener. When I record auditions in my studio, and I know for a fact that the actor is not off book, but he or she really seems to be listening as I read the other characters’ lines, I’m amazed at how much difference that makes. Looking like you’re listening intently is kind of a trick, but a trick worth learning. It’s not that hard, you just have to invest some of your attention to at least create a pretense of listening. If that comes at the expense of having to take some lines off the script, you are still way ahead. Remember, in an audition, whether a self-tape or in the room, the viewer is only seeing you, all the time. On stage or on set, when other characters are talking there is not as much attention focused on you. Not that you should check out then, but clearly it’s never more important to be listening than in an audition, when all eyes are on you. Ignore this at your peril. 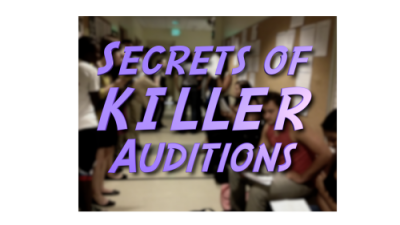 Next week, another mistake many actors make in their auditions that they can, and should, fix!